In case you feel like your stock-trim Ducati 899 Panigale is missing something or if you believe you should add certain parts to make it more suitable for what you have in mind, here's a visual guide from the manufacturer itself. The 899 Panigale can of course be used as a daily commuter and will even serve as a nice travel companion, provided you can cope with the not-that-touring riding position. But before anything, we are looking at a sport bike, so it only makes sense to see that the first add-on pack Ducati surfaces is the Sport Pack. The Sport Pack has two main goals: shaving some weight off the bike and making it look meaner. The options for solving these two tasks were a no-brainer: for the first, carbon fiber as the material of choice, for the second, the perfect finish of such add-ons, plus race-grade anodized aluminium. 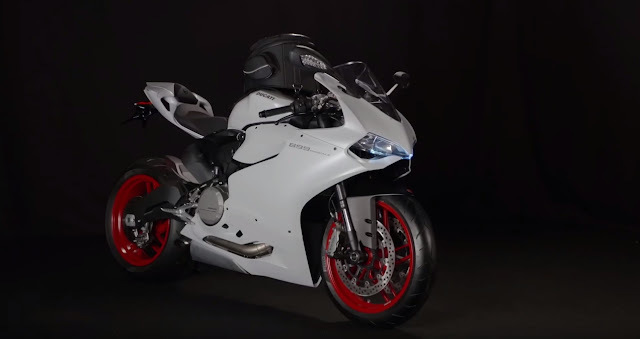 Getting the Sport Pack will endow your 899 Panigale with a carbon fiber cover for the ignition switch and a similar rear shock protector, an adhesive carbon fiber tank pad, a matching carbon front sprocket kit and similar heel guards for the passenger foot rests. At the same time, a racing aluminium tank filler plug anodized black will replace the stock one. The new license plate number is made from aluminium alloy and carbon fiber, and black aluminium bar-end caps are also on the list. If traveling in the saddle of your 899 Panigale is one of the things you plan to do more than often, then you might be thinking about getting the Touring Pack. It's hard to decide which item on the list is more important, as Ducati prepare a neat selection of upgrades. For starters, if you are going to tour with your 899 Panigale, you'll most likely ride on less-than-perfect roads, so Ducati thought a metal screen protector for the radiator was a really good idea. It will allow your bike to take a beating from rubble and other debris without taking any damage and let you carry on towards your destination. Also in the "defense department" we stumble upon an anti-theft kit with an integrated alarm. Longer-range comfort is taken care of by a special seat designed for better support for a prolonged time, while the cargo capacity is extended with the addition of a magnetic tank bag with a total 12-liter (0.42 cubic feet) capacity. Ducati has even more items on the list, so the possibilities do not end here, but it's up to each rider to choose what he or she wants.